GRAND CHUTE, WI - Back by popular demand, Donald Driver is returning…to Neuroscience Group Field at Fox Cities Stadium for another charity softball game! The Green Bay Packers All Time Leading Receiver, Super Bowl Champion, Dancing with the Stars Champion and New York Times Best Selling Author will host his game on Sunday, August 5. Game time is 1:05pm. "I continue to appreciate and thank the amazing fans that support this game. Last year's response was truly overwhelming, and I can't wait to connect with everyone this year to raise money for an important cause," said Driver. 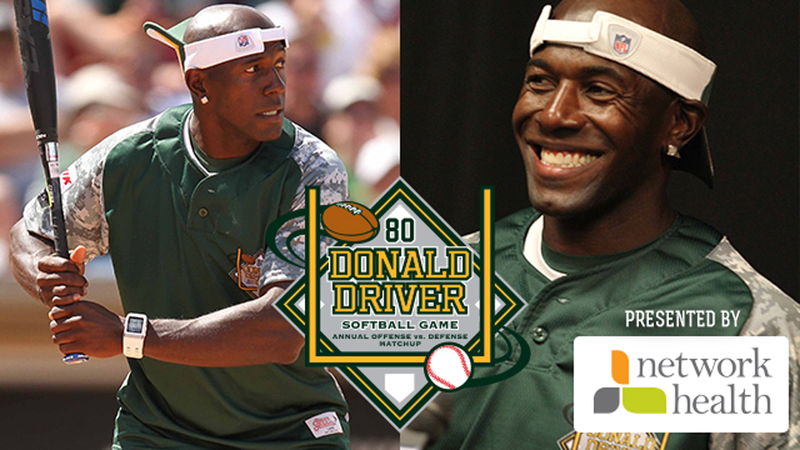 "Donald Driver's softball game is the highlight of the summer. It's a fantastic atmosphere for everyone to witness the joy Donald gets from spending time with his family, friends and fans," added Coreen Dicus-Johnson, President and CEO of Network Health. "As we pursue our mission to enhance the life, health and wellness of the people we serve, Network Health could not ask for a better event or a better partner in that journey than Donald Driver." Participants for this year's game will include Green Bay Packers Legends and celebrity friends of Donald. Green Bay Packers Super Bowl Champion and current NFL Network Analyst James Jones and 2017 Donald Driver Charity Softball Game MVP Steve Novak will each participate in the game. Tickets for the softball game are $50 for a front row box seat, $40 for a standard box seat, $25 for a reserved bleacher seat and just $10 for a general admission grass seat. There are also a limited number of patio tables - which seat four - available at $200. The patio tables will include one autographed item signed by Donald Driver. Fans may begin to purchase tickets for the Donald Driver Game at 10am on Tuesday, May 1. If you are a Network Health member or bought tickets to the Green & Gold Charity Game, you may purchase tickets starting at 10:00am on Wednesday, April 25. The pre-sale will end for Green & Gold Charity Game purchasers at 5:00pm on Monday, April 30.